is it essential to have a designated work area? Are there strictures around study environments? What if my child refuses to sit at a desk? The truth is that learning can and does happen any place. While it is clearly beneficial for a child to have good lighting for reading, computer work, writing, etc., and it’s not good for children to spend too much time tucked away in a tiny space like the hall cupboard, home education can take place in a thousand different places. Some children thrive with having their own space, while others have to be in the thick of things at the kitchen table or constantly under your feet. It’s always a matter of finding what works for you. When we started home educating (pre-school age), we didn’t live in a very large house. We didn’t have space for a designated ‘school’ area, so the dining room table was pretty much ‘it’. Back then, we had a small trolley which stored all our books, stationery and school-specific items, and that was packed away and stored in its little corner at the end of each day. The wall about the sideboard was festooned with all our letters – letter C was filled with coloured cotton balls for clouds, F was filled with fuschia-coloured fluffy feathers, W was filled with wood-shavings from Brad’s shed, etc. 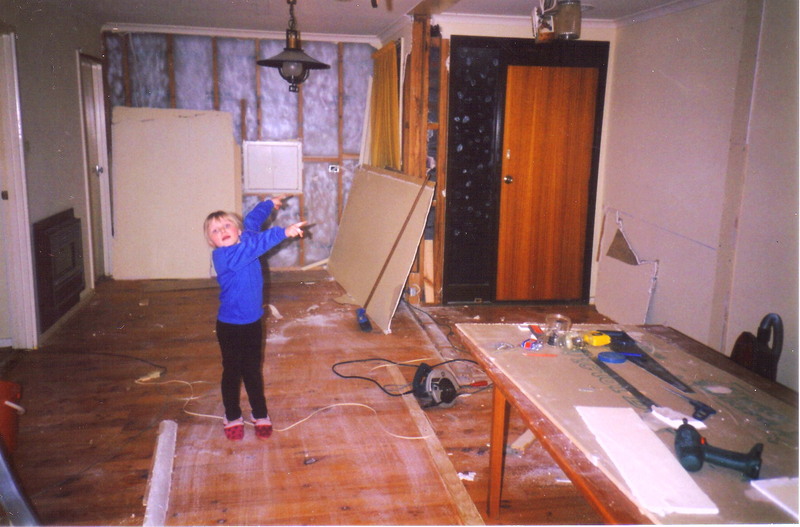 When we moved to Canberra, Hayley was just six, and we began renovating. Our dining table was the workbench from Brad’s shed and our dining chairs were the garden- plastic variety. We had a bigger school trolley, but everything had to be mobile because things moved around so much from one weekend to the next. 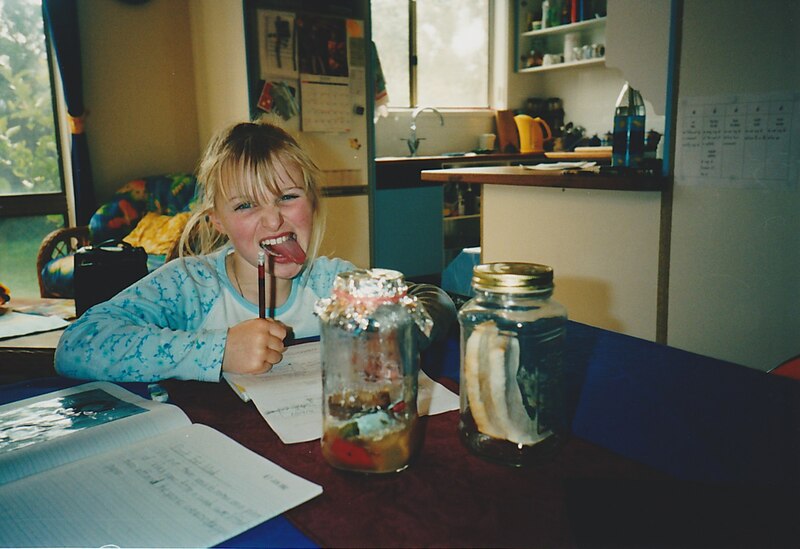 Home education still happened, though – sometimes it was on a designated bench, other times it was on the specially cleaned workbench/dining table, and things were pinned up all overthe place. At one stage, we had a self-painted scale model solar system pinned onto a black queen-sized sheet, which was literally nailed to a wall which was destined for later demolition. Even if you follow a more formal style, as we did back then, home education can be conducted quite successfully in the midst of renovations or major travels. Just as some families prefer a more formal curriculum, some students prefer to have a designated work environment. Larger families will, from sheer necessity, have a very different dynamic to single-child families. Just as the approach to home education must be child specific, the setting must be family relevant. In our family, the allocated ‘school’ area became available as our renovations progressed. Because Hayley worked best with me at least nearby, we set up our room with two desks, side by side. If she was happily working away, I could get on with preparing something for future study, and I was handy if she needed help. I was also handy to the laundry, to keep things moving in that department – I’d often do a quick bit of housework while she was having a scheduled break. That arrangement worked well for us for several years. I read somewhere in our early days, that if you have the opportunity, arrange for the home education workspace to be fairly central to the laundry and kitchen in your home. That way, the general business of running the household has a better chance of ticking along. If the primary home educator is trying to get a jump-start on cooking dinner up one end of the house, but the home educatee is up the other end of the house yelling for help and stuck until help arrives, it doesn’t do much for anyone’s peace and equilibrium. Our house is neither ideal nor a total nightmare in the layout regard. The laundry is relatively close, but the kitchen is yelling distance. 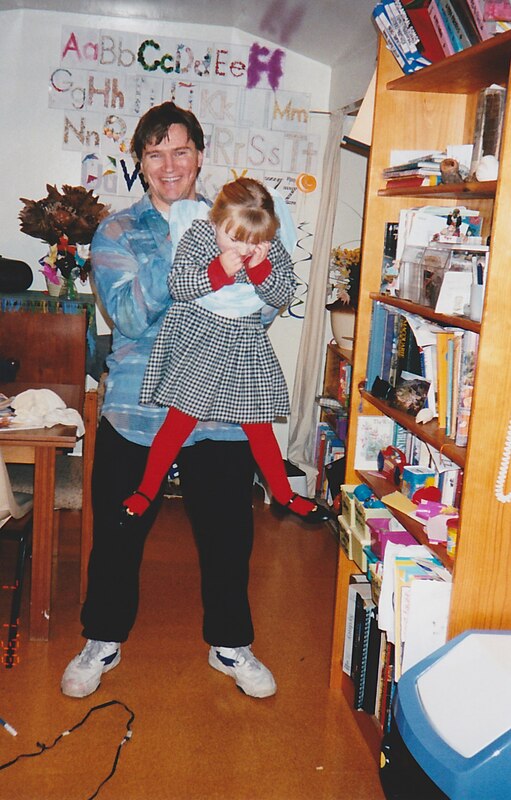 I’m not fond of being yelled at, which is why I tried to be in the room as much as possible while Hayley was completing her more formal lessons – it helped us both maintain our composure. 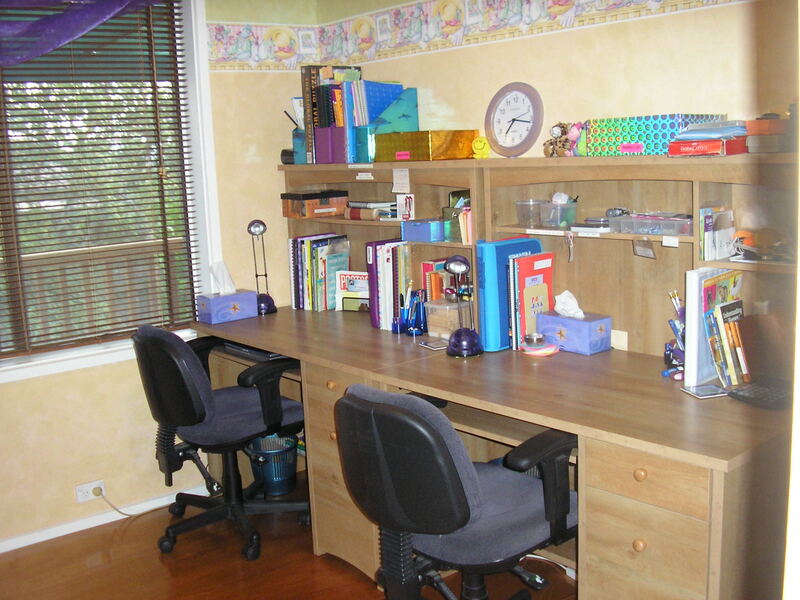 Informal work-spaces for home education take on a wide variety of forms. The most popular is possibly the kitchen table, but spread out all over the floor or the child’s bed is popular too. Use informal settings liberally, even if you have a more formal approach to home education – it’ll help maintain your sanity and your joy. Of course there are all sorts of informal settings, too. Up trees, in coffee shops, on rugs on the lawn, in the middle of the trampoline … you’re only really limited by your imagination on that score! Really, interspersing any style of learning with a spontaneously different location can lift spirits tremendously. Never hesitate to take lessons outside into the sunshine, or even off to McDonald’s – wherever you feel like. Arguing favourite Shakespearean quotes over a burger and fries can even be quite good fun, believe it or not. Officials were historically reputed to be concerned about lighting or ventilation of work-spaces for home educators, but as one long-term Canberra resident assured me, “almost every house in the ACT has good lighting and ventilation!” In the midst of renovations, I’d have had to disagree, on a purely personal basis. Our lounge room was sorely lacking in both, hence it wasn’t a popular work-space for either Hayley or me. I’ve also heard concerns expressed, that children who don’t do their lessons sitting bolt upright on straight-backed chairs will end up like Hunchbacks of Notre Dame. I have a sister, two nieces and numerous friends who are school teachers, and all of them snort at such suggestions, saying, “There’s no child in my class who sits bolt upright at any time, or even mostly upright, unless they absolutely have to!” Generally, children who are well nourished and active aren’t likely to have problems with posture. As 2007 progressed for us (Hayley was 13-14yo by then), the whole designated area thing was fast losing its appeal for Hayley. While lots of learning still took place, it got to be a rare occurrence for us to be in the allocated room at the same time as each other. It startled me somewhat to realise just how much Hayley suddenly felt that our room had developed a highly contagious disease of some sort. Instead, I’d find our girl curled up on her bed with a book, or sitting cross-legged on the lounge avidly researching something or other. Sometimes we’d take something out to the side patio together and share the sunshine as well as the subject. It worked well, providing I didn’t try to orchestrate it too much. Honestly, I hadn’t realised just how house-bound we’d become. Perhaps I thought that now we had this nice room to work in, we didn’t need all the alternate locations. At one point during that year of change, Hayley said to me wistfully, “Do you know what I miss?”I miss when I was little, and after my morning break, we’d go around the side in the sunshine and you’d read the story to me and I’d try to catch lizards while you read and then I’d answer the questions.” I did remember that. It was a particular comprehension series we did, and I remember learning back then that Hayley listened best when her fingers were busy. Towards the end of 2007, Hayley began to talk about having her own writing space again. She didn’t want to use her desk in our designated room, however, as that was ‘shared’ space – which it was, and is. Our solution, after some discussion and research, was that Brad made Hayley a small desk for her bedroom, which became well used throughout 2008. Teenagers often crave their own space, and their writing can become quite private and personal during this time. We feel that needs to be respected and provided for within family life, as much as possible, hence our desire to find a solution that was agreeable to all of us. A friend who has studied psychology tells me that this is a valid part of a teenager’s ‘individuation’. our home education helps us and our children not to stagnate. It keeps the air fresh, even if only metaphorically. I love the concept of a ‘rich environment’, one where a variety of resources and stimuli from all sorts of mediums are part of the everyday world. In 2008 I visited the home of a very dear friend whose oldest child was a baby last time we saw each other close enough to hug. When they moved to just a few hours drive away, we did a wonderful day visit, and us mums talked our children bored-silly! We’ve done it often since, too, especially precious as we are both home educators now. This family may not appear to be “rich” by the standards of this very consumerist society we live in. They are rich, however, in every way that matters. I’ve shared this example of my friend to point out that you don’t have to “be rich” in order to create a “rich environment”. Second hand furniture, resources and decorations can be every bit as functional as brand spanking new stuff. to turn mirrors into windows.